Theme for a new challenge at Robyn's Fetish Blog this week is Cards For New Baby. Our sponsor this week is The Crafty Pad with an amazing prize - 3 single digis of the winner’s choice OR 1 digi set and 1 single digi, excluding personalized books. So hop to Robyn's Fetish Blog, check out DT's work and get creative!! Сьогодні на Robyn's Fetish починається нове завдання - листівки для новонароджених (Cards For New Baby). Спонсором цього тижня є The Crafty Pad із трьома штампами на вибір переможця. Чекаємо ваших надзвичайних робіт!! Якщо ж вам потрібно кілька прикладів для натхнення, то зазирніть на блог Robyn's Fetish і перегляньте роботи всіх дизайнерів! 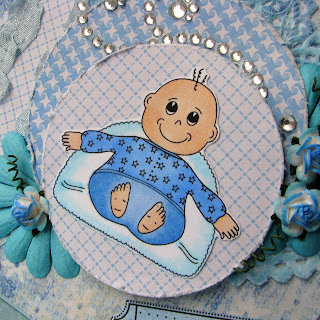 For my card I've used New Baby Boy image and Handle with Care sentiment. Coloured with copies, and (pretty unusual for me) added a lot more details than I usually would. Ribbon's are from Pixie Dust Paperie. Для своєї листівки я використала штамп New Baby Boy та напис Handle with Care. Малюнок розмалювала фломастерами копік. Стрічка з магазину Pixie Dust Paperie. Beautifully done! Love the heart doily you added on this. I am not a huge fan of distressing but you made it look beautiful here. Love the bling swirl, too Wonderful job! Awww! How sweet. Very beautiful. Adorable card. Wonderful embellishments. Congratualions ! 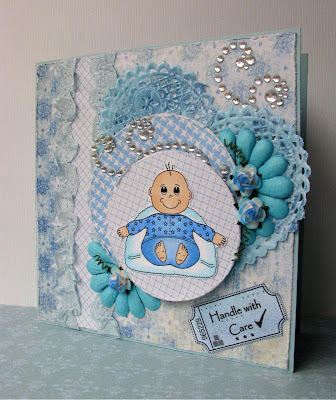 This is such a pretty card, I love your lacy detail and fab embellishments. Aww sweet! Thanks so much for joining in with the Charisma Cardz challenge this week. I just love the ribbons and the heart doily! Thank-you for sharing with us at The Poodles Parlour! Cute card ! 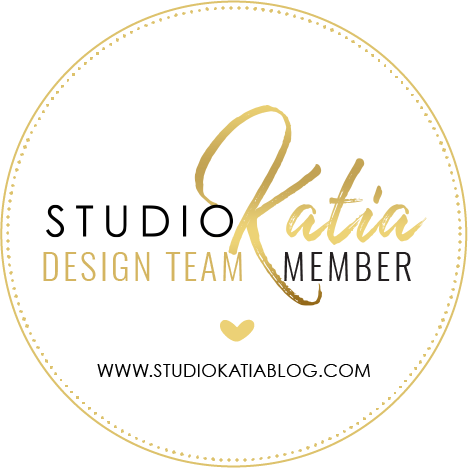 Tks for playing along with us at the House of GILLI Challenge Blog.